Instead of purchasing commercial soaps that may contain chemical skin irritants, you can make your own natural milk soap with goat’s milk. Goat-milk soap moisturizes skin as well as the purported health advantages of providing relief from eczema and skin allergies. You can make your own natural milk soap at home and save money because the ingredients used to make the soap are inexpensive versus the cost of purchasing goat-milk soap in a boutique. Pour the partially frozen milk into a bowl, and add the lye slowly. Stir until no lumps exist, and the mixture reaches a temperature between 95 and 100 degrees F.
Pour the olive and coconut oil into a pot over medium-high heat. Stir in the shortening. Continue to stir the ingredients until they reach a temperature of 115 degrees F.
Combine the lye solution and milk with the oils. Add 1 oz. of lavender oil. Stir the ingredients with a hand blender until the mixture traces. When the mixture drips from the blender back into the bowl, it will leave a path on top of the mixture. Pour the mixture into soap molds. Allow the soap to harden for 24 hours, and then remove it from the molds. Allow it to cure for 6 weeks before you using your goat's milk soap. Measure the ingredients by weight instead of volume. Use a digital scale for best results. Always wear gloves and protective eye wear when handling lye because it can burn your skin. 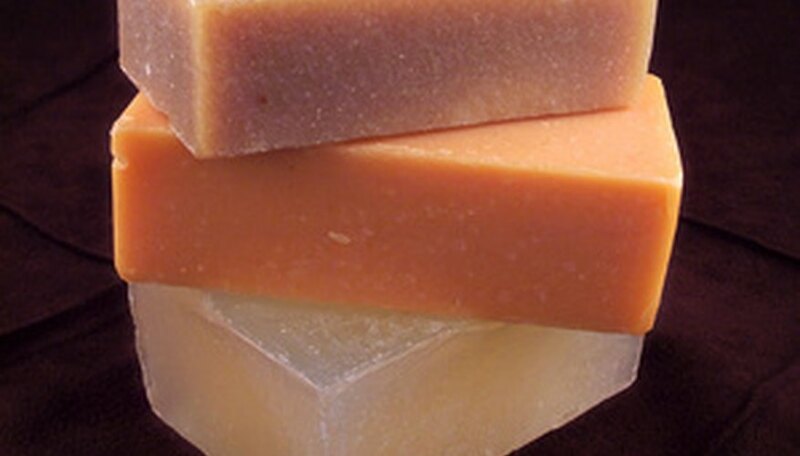 According to Fiasco Farms, the lye and the fats undergo a chemical reaction during the soap-making process and the resulting soap is mild and does not retain any of the harsh properties of lye. Do not substitute any ingredients in the recipe as this can alter the soap and can make it unusable.